An Englishman in Colombia: A Serious Case of Man Flu! 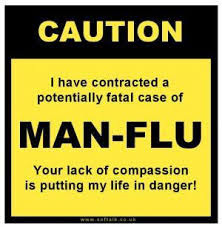 A Serious Case of Man Flu! The last twenty four hours haven't been that brilliant, yet another Colombian National Fiesta week-end, there are people at the Finca de Recreo nearest to us. I wouldn't mind, but they had the music volume at a considerate level all evening, then when I was ready for bed, they boosted the volume, and it stayed like that all night. Hahahaha! as I had been home alone, with Marcela out for a 'Girlie' night with her friends, there was no one to get any sympathy from anyway. At 9am as arranged the man we had contacted to quote us for the work needed, John, arrived, it seems Colombia has it's own way of doing things, as he came up with the same idea as Marcela, to divert the waste 'clean water' pipe, and not put a new one to the trap, but cut it before it entered the side of the house to join the old plumbing, and insert it into the rain water pipe, that would just leave the visitors shower room on the old route. Not strictly ethical, but it would reduce the problem somewhat, as we only use the visitors shower room to wash hands, and of course when we have visitors, which recently has not been often. John just has to confirm the rain water goes down into the drain junction in the lane below, if not we are looking at major work. The second problem is the floor in the drying area sinking, and consequently the posts holding up the roof sinking with it, has been thrown in the air again, my idea was to cut through the floor, in three places, and then dig down a meter, to fill with a concrete base, but John stated the finca in on a float for a reason, the ground is soft, the old fincas, that were on the plot now housing my workshop and garage are on rock solid land, but this end... I would have to dig down nearly three meters, which is not an option. John stated the problem is rainwater, getting under the slab, where it joins the perimeter wall, and where we had a mango tree removed, previously the tree took all the moisture, which is no longer the case, so he is recommending another concrete slab 4cm thick on top of the original, and then tile it to seal it from water ingress. I presume we will have to temporarily support the lean to roof, whilst this is done, then cut the existing posts to fit, and attach the bases with construction adhesive, instead of bolting them down. The idea is that I supply the materials, most of which we can get next door, except the tiles, and he will quote for labour, now we wait to see what he comes up with. Fortunately unlike last time, he has just bought a new car, I just hope he hasn't got a new house on his shopping list!!! Now to psychologically prepare myself for a second night of loud music, I don't believe I am lucky enough to believe they only booked one night!